This supplement contains solely green coffee bean extract, which has high levels of chlorogenic acid. This has been shown to help remedy a variety of health concerns including obesity, diabetes, high blood pressure, and bacterial infections. The vegetarian capsules and only two ingredients make this a good option for those looking for an all-natural weight loss supplement. In each tablet is 800mg of 100% green coffee bean extract contained in a vegetarian casing. The powder is ground from green coffee beans, and is guaranteed to contain a minimum of 50% chlorogenic acid, the active ingredient which supports weight loss and slows the release of insulin into the bloodstream to enhance liver function. As this product is derived from coffee, there is caffeine in the tablets, although it does not note how much. The company states on its website that it has a commitment to sustainability, both environmental where the beans are grown and economical through harvest practices. Genesis Today recommends taking two capsules 30 minutes before meals, at least once a day but up to three times per day. The manufacturer suggests that women who are pregnant or breastfeeding to avoid this product, as well as anyone who is sensitive to caffeine or has a history of low blood sugar. Children should not be given this supplement. 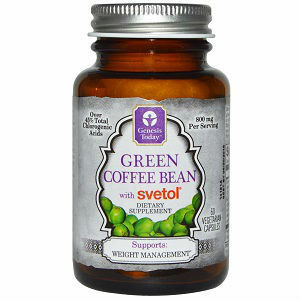 All of the side effects of green coffee bean extract are associated with the high levels of caffeine present in the supplement, and include diarrhea, increased anxiety, increasing pressure in the eyes for those with glaucoma, worsening symptoms of IBS, and causing an increase in the release of calcium for women with osteoporosis. Some individuals have reported sleeplessness, racing heart, and shakiness. Those with a history of any of these conditions should consult a doctor or healthcare professional before using this supplement. It is perhaps advisable to limit consumption of this supplement if you are also a coffee drinker to minimize these effects. This supplement is listed on the manufacturer’s website for $23.99. It is also available at large retailers like Walmart, through local supplement stores and pharmacies, and through online pharmacies. The lowest price we found was $15.24. There were no discounts or special offers visible, but with certain orders, you may be eligible to receive free shipping. There is no product guarantee for this supplement through the manufacturer. Individuals who had purchased this product and wished to return it had difficulty finding how to do so, and seemed to be left with no recourse. This could indicate the product may be ineffective, which is also supported by the mixed reviews. Some reviewers indicated that this product may not work for everyone, and may not be of consistent quality. There are definitive benefits of Green Coffee Bean extract, and the purity of ingredients in the tablets is definitely a positive, as is the company’s commitment to sustainability. The list of side effects associated with the high level of caffeine in this product may make it unsuitable for many people. However, the very mixed reviews, combined with the lack of product guarantee, raise questions about the effectiveness of this particular product. Edward Tobias	reviewed Genesis Today Green Coffee Bean	on December 13th	 and gave it a rating of 2.